Fuze, the leading cloud-based communications solution provider for the modern global enterprise, today announced that independent market research firm Synergy Research ranks Fuze as the most widely used UCaaS technology among today’s large enterprises in its UCaaS Market Tracker. Overall, Fuze owns more than 46 percent of the market for enterprise UCaaS solutions – nearly two times the share of its nearest competitor – according to the Synergy Research report for Q2 2017. 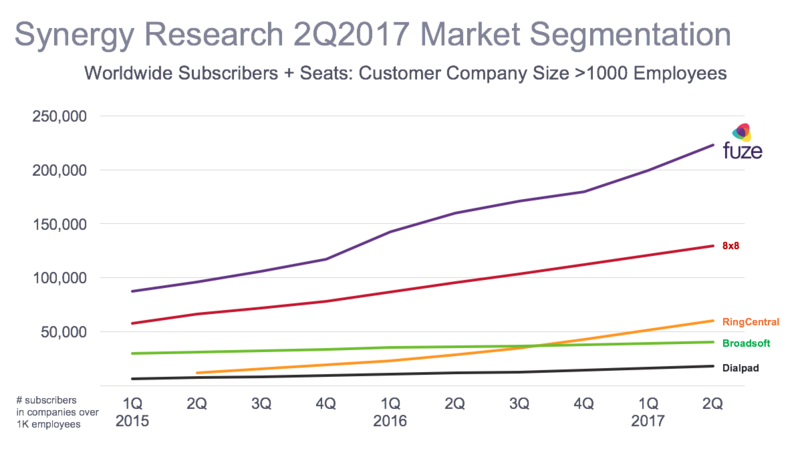 Fuze boasts more than 220,000 subscriber seats in the market segment for companies with greater than 1,000 employees, approximately 93,000 more than its nearest competitor. Fuze has solidified its lead in the enterprise segment over the past year, expanding its subscriber base by nearly 40 percent since Q2 2016 and increasing year-over-year revenues by 47 percent. Fuze has added more enterprise subscribers than any other competitor over the past two years. Fuze’s leadership in the enterprise is also exhibited through its implementations with well-known brands, such as The Associated Press (AP). Deploying Fuze since 2014, AP equipped its team with the Fuze platform during the 2016 Rio Summer Olympics to ensure call quality and connectivity. “UCaaS continues to provide a richer and more cost effective collaborative communication system for businesses globally,” said Jeremy Duke, Synergy Research Group’s founder and Chief Analyst. “We are seeing an up-market acceleration of UCaaS adoption, moving from serving mostly smaller sized organizations now to gaining traction in businesses of over 1,000 seats. Fuze continues to do very well establishing itself as a strong competitor in this emerging, high growth UCaaS segment." The Synergy Research ranking continues Fuze’s strong momentum in 2017. In the first half of the year, the company posted a 51 percent year-over-year increase in subscription revenue; 93 percent growth in EMEA activations; and 180 new customers, including NHST, iPayment, Boon Edam, Ascendis Pharma, FIME and The Rockport Group. Fuze also secured $134 million in funding this year, bringing the company’s total funding to $334 million. Click here to learn how to equip your modern enterprise workforce to stay connected, productive, and collaborative.